The OMG-PIO-24-LPCI Low Profile PCI digital I/O interface provides 24 channels of buffered drive digital I/O emulating 8255 mode zero. The board can be utilized for PC-based control and automation of equipment including sensors, switches, security control systems, and other industrial automation systems. 10K pull-up resistors are included and optional values are available. The OMG-PIO-24-LPCI contains three groups of eight-bit I/O ports. Each group is individually configurable as input or output to suit the automation task. The board is MD1 Low Profile and Universal Bus (3.3 V and 5 V) compatible and ships with a ribbon cable terminating in an industrystandard 50-pin IDC connector. The OMG-PIO-24-LPCI is for use in Low Profile PCI slots only. 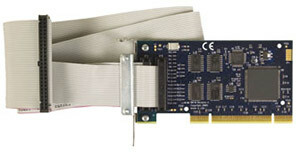 If you have a standard size PCI slot, order the OMG-PIO-24-PCI. These boards are compatible with Windows XP/Vista/7 and Linux and include programming support for Visual Basic 6 (and higher) and Visual C/C++. 참고: Each unit supplied with utility software, 1 m (3.3') ribbon cable with (2) 26-pin IDC connectors to an industry-standard 50-pin IDC connector and complete operator’s manual on CD.